The UpLULA is a military-grade universal pistol magazine loader and unloader designed for loading and unloading virtually all* 9mm Luger up to .45ACP magazines, single and double stack and 1911s of all manufacturers. It will also load most .380ACP double-stack mags. 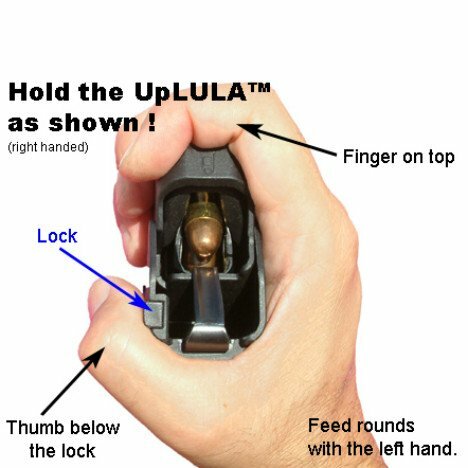 The UpLULA loader does it all easily, painlessly, and perfectly reliably! Astra, Auto Ordnance, Barak, Beretta, Browning, Bul, Colt, CZ, EAA, FN, Glock, HK, Hi-Point, High Standard, Jericho, Kahr, Kel-Tec, Kimber, Les Baer, Llama, Luger, Magnum Research, Para Ordnance, Pheonix Arms, Ruger, Sigma, Sig/Sauer, S&W, Springfield Armory, Star, Steyr, Taurus, Vector, Walther, and more. 9mm Luger - All pistol magazines in that caliber. * - Loads & unloads well ! .357 Sig. - All pistol magazines in that caliber. - Loads & unloads well ! 10mm - All pistol magazines in that caliber. - Loads & unloads well ! .40 - All pistol magazines in that caliber. - Loads & unloads well ! 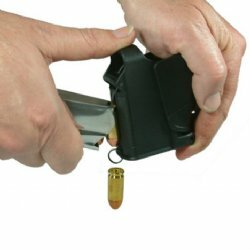 .45 ACP - All pistol magazines in that caliber. * - Loads & unloads well ! Suggestion: Use our 1911AI Aligner Insert with the UpLULA to assist loading single-stack mags of up to 14.5mm (0.57") wide. The 1911AI narrows the width of the UpLULA inner cavity to allow less mag wiggling thus enabling better stabilization during loading of single-stack mags. .380 - Beretta 84 Cheetah - Loads & unloads well ! 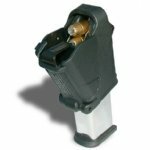 .380 - Bersa Thunder Double Stack - Loads & unloads well ! .380 - CZ 83 - Loads & unloads well ! .380 - Glock .380 - Loads & unloads well ! .380 - Glock 42 - Loads & unloads well ! Our 1911AI is not needed. "A Great Device to Have"
Product Review: This is a really nifty thing to have. 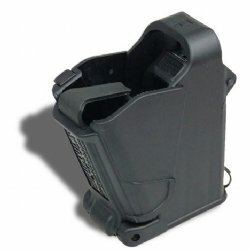 It allows me to speed load my Glock mags with no effort at all . . . even my new mags with their very tight springs.